At the Razer online store, you can buy the latest and best gaming laptops, that exude design, performance, portability and convenience to enrich your gaming experience, giving you the epitome of modern technology. Packing the power of a full sized PC into a sleek and light portable device, these gaming laptops are a must for anybody wishing to experience a gamer’s paradise. With Big Apple Buddy’s personal shopping service, you can now buy directly from the Razer online store anytime, anywhere. 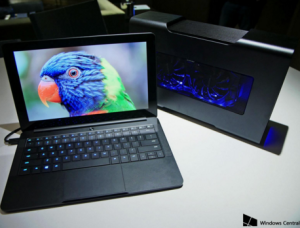 Razer Blade Stealth: The Razer Blade Stealth is the ultimate ultrabook, with it’s super slim frame and easy portability without compromising on performance. With about 8 hours of battery life, this laptop can help you get by your work as well as give you a great gaming experience. With the 6th Gen Intel Core i7-6500U processor, the Razer Blade Stealth assures great performance as well as amazing visual clarity featuring 100% Adobe RGB color space coverage and wide viewing angles of up to 170 degrees. Razer Leviathan: The Razer Leviathan 5.1 Channel Surround Bar easily fits under desktop monitors or living room console setups. Powered by Dolby technology, the Razer Leviathan contains superior surround sound drivers and subwoofers that enrich the base sound to make your gaming or music experience edge closer towards perfection. Connectable with any bluetooth device over a range of 10 meters, the Razer Leviathan conveniently remembers your recently paired devices in order to maximize convenience to the tap of a button. 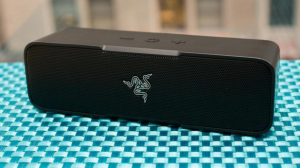 Also available is the Razer Leviathan Mini which is a portable woofer containing an uncompromising sound performance. 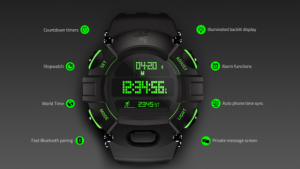 Razer Nabu Watch: With complete mastery over time, the Razer Nabu Watch introduces state-of-the-art technology around your wrists, performing all possible functions expected of a smartwatch. Containing a unique secondary screen that displays desired cellphone notifications, the Razer Nabu Watch also performs fitness tracking operations and contains a battery life of up to 12 months, freeing you from the hassle of recharging it daily. 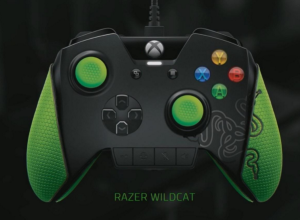 Razer Wildcat for X-Box 1: This gaming controller is developed after feedback from the worlds’ best eSports athletes and is designed for tournament play, making it ideal for serious gamers. The controller contains 4 additional fully-programmed buttons, through which gamers can customize settings to their needs to perfection. Unfortunately, the USA Razer online store only ships certain brands to select countries. However, Big Apple Buddy, your personal shopper, can help you buy products directly from the official USA Razer online store and ship them to your doorstep, no matter where you are in the world. If you would like to buy from the USA Razer online store, simply let us know which items you would like to order (by filling out the form below) and we’ll get back to you with a free international shipping quote within 24 hours!